You Go Girl! : LOVE this appetizer - savory and sweet! I have had this recipe for over 20 years. A dear neighbor in Katy, Texas ... Kendra shared this with me... along with the recipe. She called it Cheese Souffle. 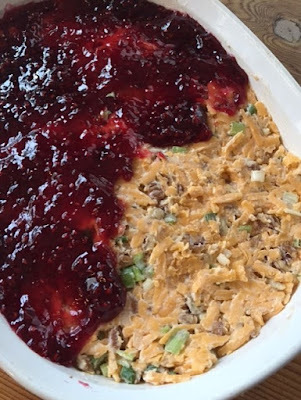 It reminds me of a yummy, flavorful cheeseball with sharp cheddar, green onions, pecans, mayonnaise... and topped with delightful raspberry preserves. I know it sounds like a weird combination but I promise, you will love it. I brought it to school last week and told the teachers... "I know it looks a little weird ... but you have to try it!" They loved it too. We enjoyed it for two days at lunch! I snapped this picture as I was spreading on the raspberry preserves - so you could get the idea! 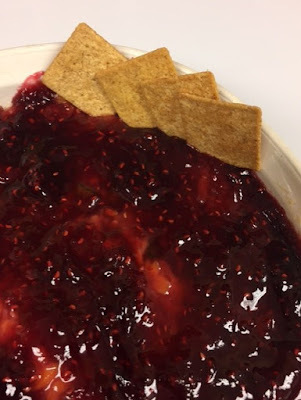 I served it with Wheat Thins - but any favorite cracker will do!